Background for why I'm baking during the week: During the summer I am able to go to Tae Kwon Do classes on Thursdays. Unfortunately, once the school year begins the Thursday TKD class is switched back to what I like to think of as "Crazy People TKD" class, wherein competitors try to kill each other and themselves. I don't attend this class. Luckily for me, though, I've managed to arrange general socialness this weekend (read: Sam offloads baked goods on unsuspecting friends). I decided to try this recipe, as I respect any recipe that has a LOT more chocolate than all the other ingredients put together. Mostly I followed the directions as listed. I did make a few changes, though. The most basic change stems from the fact that I am a poor grad student, and poor grad students (even psycho baking ones) don't have tons of high-grade chocolate on hand. I therefore replaced the unsweetened chocolate with a couple squares from an 85% lindt chocolate bar I picked up on sale not long since, and replaced the six ounces of bittersweet chocolate with 3/4 cup (which is roughly equivalent volume/weight) semi-sweet chocolate chips. (Costco sells 10 pounds of semi-sweet chocolate chips for $17.99. I love Costco). In order to compensate for these changes I dropped the sugar from 2/3 C to 1/2C. The second change came about because I always freeze my raisins because I buy them in bulk from the local co-op; bulk foods are notorious havens for nasty little bugs, so I like to be careful. Unfortunately, this can lead to interesting baking if (like me) you don't have a microwave to thaw things out quickly. Also, I was suspicious about how good raisins would be in chocolate cookies. 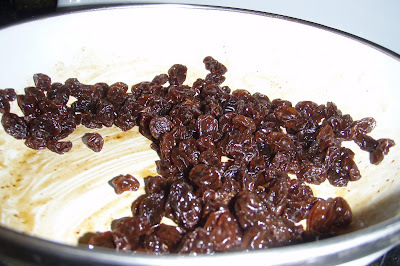 My solution was to take about a cup of raisins (I didn't bother to measure) and cook them in a splash of rum. This had the advantage of tastyifying the raisins while simultaneously thawing them out. In order to not throw off the liquid/dry ingredient balance I made sure the rum was all cooked away before adding the raisins to the cookie dough. Next I melted the chocolate chips/lindt bar squares with butter as directed. 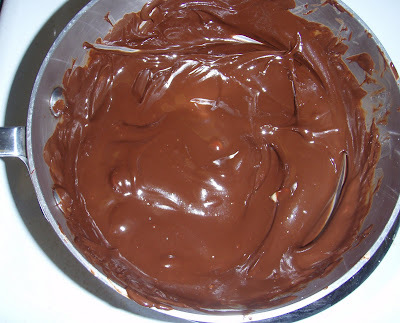 I've found it's a good idea to turn off the burner (if you have an electric stove like mine) halfway through; it will retain enough heat to gradually melt the chocolate. Do not turn your back on this step; chocolate melts and burns quickly! This is what it should look like right before it's done; at this point you can see small bits of butter remaining, but it's basically smooth. I recommend removing the pan from the burner entirely at this stage; the chocolate is warm enough to finish melting all on its own. I am a huge fan of my stand-alone mixer. That being said, I did (and would strongly recommend that others do as well) follow Ms. Greenspan's directions about mixing in the last ingredients by hand. 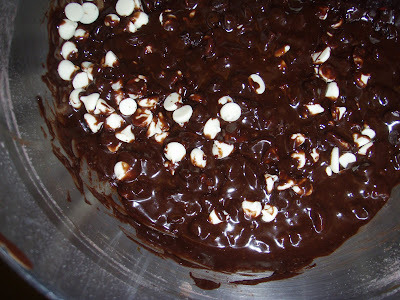 I chose to use 3/4 cup each semi-sweet chocolate chips and white chocolate chips, and about 3/4 cup pecans. There are, at this point, way more add-ins than dough. Luckily for me, someone gave me a silicon sheet several years ago. I placed this on a cookie sheet and very carefully scooped cookie dough onto it. The dough at this point is almost more like brownie batter than normal cookie dough, so you must use a spoon to drop it. I only cooked the two trial run cookies; my get-together isn't until later in the week. I'll try to update with a better picture once I've baked some more cookies. All in all I'm extremely pleased with this recipe and will make it again. I'm just hoping that a rich, distant and unknown relative will die and leave me a chocolate factory so that I will be able to make them frequently without having to worry about replenishing my baking chocolate supply. Probably fantastically well. I don't have any (no TJs in Vermont, as I may have mentioned once or twice) or I would've used them. Also, I wanted to swap out dried cherries for the raisins (although the raisins were great), but at $10.99/lb I winced and regretfully decided against it. The white chocolate chips worked pretty well; I used Ghiraldhelli (sp?) white chocolate partly because I like the contrasting colours. It's hard to find white chocolate without milk, though, so it prob. wouldn't be great for your household.